Personally I see no need to replace the Metrocard , which I find to be better than London’s vaunted Oyster. And while he has been a very good executive, that does not mean that he should be mayor. The Metrocard is flawed in that it cant be used as a regional farecard unlike Smartrip or ORCA. But that’s not a technology problem. The PATH adopted MetroCard pretty easily. Let others do so too. No need to reinvent the technology wheel. I like the fact that MetroCard allows you to pay for up to three additional passengers who travel with you, a flexibility that Oyster does not give you. PATH had a similar to MetroCard which has been rename to SmartLink Gray, the same company who invented MetroCard, Cubic for almost 3 decades. It was very simple adaptation. The MetroCard magnetic stripe technology is outdated and MetroCard serial numbers is are running out. That’s not a limitation of Oyster. That’s a limitation of London’s fare structure. After a few uses (3? ), Oyster converts to a pass so the rest of your rides are free for the day. It can’t do that if people are sharing it. It’d be nice if MetroCard did that, though the price would be a fare structure more like London’s. The price cap for the day – that’s pretty meaningless I think for most. It might benefit tourists, but they already benefit by a really cheap NY system. Locals who want to ride the train all the time can get a weekly or monthly unlimited. Has London ever seriously considered going to a one fare system? I like simplicity, and one fare is nothing if not simple. And London has a small army of fare people manning the fare gates to deal with problems that people have – there would be fewer problems if it was only one zone. I dunno. I don’t know a lot about London, but I don’t think it’s meaningless anywhere for inner city dwellers with variable/sporadic demand for the system – in NYC, those of us within subway spitting distance of Midtown – or lots of tourists. Most people on this blog seem to regard NYC’s flat fare structure as a bug. I never heard of London considering it, but I don’t see any historical or operational reason why they would. They seem to have a pretty good grasp on the structure they have. I see flatness as the hugest of advantages…simple, no need to swipe at exit, no need to have swipe readers or extra staffat exit, no need for the tourist to hold onto a ticket- plenty of first time tourists in London dont know that they even should keep it and have to be assistaned. Trying for a zone system in NY would start a war with the Bronx, Queens Staten Island and some of Brooklyn just like the stupid idea to tax street parking would do. And if zone fares were implemented, it would depress ridership from people who dont’t always love transit in the first place. Really really really bad ideas. I prefer to keep it flat myself. I always see it as a moot debate though, since changing it just creates more problems, even if it’s nice in theory. Flat fares are standard in the older cities of the United States, because around the 1900s most cities had laws mandating flat fares. New York only got rid of its law in the 1940s, and even then they only hiked it to a dime from five cents. I’d like to see New York keep its flat fare, because it’s less complex to implement, and paying the fare in coins would just become an absolute nightmare. The fare is already non-flat. The question is whether the region’s rail network’s innermost zone should consist of all of New York City (plus I guess the PATH shed) or only the inner portions of the city. I’m neutral on that question, but what I’m not neutral on is the need to think regionally and mode-neutrally. If New York wants to hike fares beyond Jamaica or wherever, fine. If it wants to keep a flat citywide fare, it’s also fine, as long as this applies to all modes, including in particular the LIRR and Metro-North. Also note that Oyster forces you to pay your fare depending on how far away from London you go. What Phantom said. Regional farecards can take any technology. All it takes is putting in charge people who have “Ein Ticket für Alles” tattooed on their forehead and are willing to ignore Andrew here. It can be done with smartcards, magnetic cards, or paper tickets. Problems: high maintenance costs, expensive fare media, limited flexibility, little incentive for other agencies to use it. I could probably go on. Smart cards have a lot of potential, both to improve service across agencies and to cut costs internally. An awful lot of us pay for commutes with pre tax wages. If it goes to a smart card system, it’ll still have to be one that is dedicated to commuting in some way to keep this feature. Is there a law about that? Near as I can tell, it only needs to be some kind of payment from your company to the TA – it could be satisfied with a check payable to the TA. Later they switched to a system where they mail Metrocards to us also paid with pretax money. This can be a problem, since the USPS does misdeliver or lose mail often enough. Not really. MetroCards can already be used for any trip, any day or time. The advantages with a smart card would be having the money loaded automatically each month, with no need to go to a TVM or get a new card in the mail. Personally, I think they should rebuild the signalling system of the Rockaway line entirely. The A train is going to get new CBTC equipped R211s in five years, anyway. Why do the lowest-frequency, lowest-ridership branches need CBTC, anyway, as opposed to the lowest-cost usable signaling system that can be found? Which is? They may want to get rid of the current wayside signals because they’re expensive to maintain and aging fast, and the most expensive places to keep them around might be the miles of low-usage, exposed subway expanse around the Rockaways (~5 miles from Beach 116 to Mott) and Broad Channel. Not sure CBTC is the best bang for the buck on that, but it might not be the worst – especially right now. “CBTC” seems to be a really vague umbrella term. The fact is that the lowest-cost usable signalling system, if you’re buying new, is going to be some sort of system based on track circuits for train detection, but with everything else done by computers and radio signals. That falls under the loose umbrella of “CBTC”. The trouble really is that the people buying the signal system treat the whole thing as a bit of a black art. And safety critical systems *are* hard. And you *do* have to pay a lot to hire really experienced people to design and install them. But that doesn’t mean you need to get overcharged for them; but it seems that, for whatever reason, the MTA does get overcharged by its contractors quite often. Any signalling system is bound to be cheaper than the MTA’s current signals, because those aren’t even manufactured anymore. I can imagine that part of the high cost of Sandy repairs was attempting to find compatible signals. Actually, the wayside signals in use in the rest of NYCS is not manufactured anymore. The high cost of renovating the signaling system on the line is derived from the fact that the MTA has signal parts custom-made for them. The CBTC installation costs just a bit less than the wayside signal system. Sure, but the MTA should also be looking at a modern off-the-shelf fixed block signaling system, which could be much cheaper than both. Moving-block signaling, or as the MTA calls it CBTC, is expensive to the point that cities with brownfield fixed-block systems only upgrade if they’re in an absolute crunch. For example, new RER lines are fixed-block, and the moving-block system SACEM is only installed on the central segments of the RER A, which see substantially more traffic than the busiest segments of the 4/5 in New York. Doesn’t the RER also use double-deck cars to mitigate the crush? My assumption is that the MTA is using CBTC to upgrade capacity just in case; look at how L line ridership exploded unexpectedly in the 2000s. As for the Rockaways, I don’t think that’s actually happening – the MTA has only specified CBTC for Queens Blvd and Flushing, and there’s no point in installing Rockaway CBTC when the line currently has no compatible cars, and won’t for the next couple of years. Gov. Cuomo should not have been so eager to run Walder out of Dodge. He certainly would not have run for Mayor. Instead of hand-picking the next Chair & CEO, perhaps they should issue a civil service exam and appoint off a list. Would really be more efficient to install a revolving door to the entrance of that office. Part of the problem is an effective MTA chair almost has to be a politician in all but elected office, or at least be savvy in navigating the hidden political rocks and shoals that is New York City and New York State politics. Lhotta had that coming into the job more than any transit experience, but that, combined with his management skills, made him at least for the year he was in office an effective MTA leader. Putting a transit expert into the position who either doesn’t know the vagueries of local politics or doesn’t think he or she really has to learn them as long as they’re doing their job probably means a repeat of the Jay Walder situation, where the MTA chair becomes the lightning rod for anyone wanting to bash the transit system in general, while a wholly political appointee without the management skills Lhotta brought to the table is an even worse choice. That’s because he or she would only be looking, short-term, to make themselves and the guy in Albany who hired them look good, with no concerns about long-term outlooks for the agency. Cuomo can probably find a ton of candidates who’ll do that, in the tradition of William “Keep painting the cars and forget about maintenance” Ronan for Nelson Rockefeller. Hopefully the governor will find someone that actually cares about improving the agency and has sharp enough elbows to fight their own battles in the political arena. The skill set required to be a good MTA chief would seem to have a large amount of overlap with the skill set required to be a good mayor. Do any of the other people gunning for the mayoralty have any managerial experience? Scott Stringer seemed pretty competent, but he dropped out a while back. There are a few self-made businessmen running, but with very few exceptions, that almost never translates into an effective politician. The post-Bloomberg era is going to be interesting – it’ll probably be a less dramatic version of the transition to the post-Daley era that happened a few years back. Well, New York doesn’t yet have any high-profile candidate like Emanuel, unless Bloomberg gets his wish and Hillary Clinton runs. I’ve been thinking on this some more. I guess my biggest concern is that his candidacy will encourage other candidates to scapegoat the MTA when the blame lies with them and Albany. I’m worried that the public will continue to misunderstand our mass transit challenges. On the other hand, maybe his candidacy will be an opportunity to set the record straight? 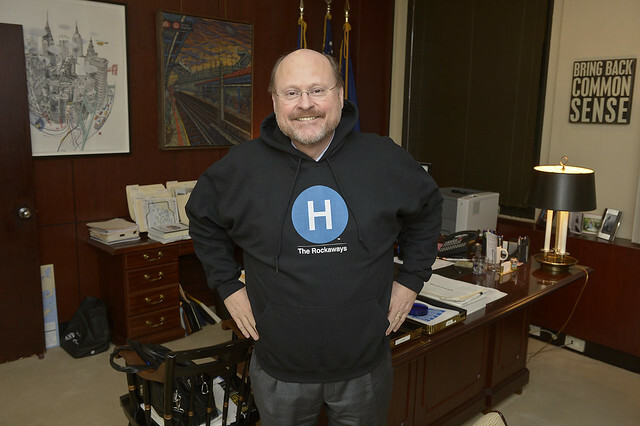 What, no SAS exit interview with Lhota? Did he at least friend/follow you on Twitter yet? He has responded to me and retweeted me. He never followed me. No exit interview yet. I had a face-to-face lined up for early January but that was canceled today. You might create some stability in the office if you spun the MTA off from the state and made it an independent agency, run by someone elected by people w/i the MTA service area every four years. The only real problem I see with independence is that the MTA depends on money from the state for a decent chunk of its operating budget and the state would have incentive (even more incentive) to skimp on that if the ties were severed. That said, I think it’s a clear enough issue that the MTA chairman could rally voters on that issue and, thus, the incentives for legislators would be the same. The other solution would be to give the MTA taxing powers w/i its service area as well as control over fares.